One of the reasons I switched to KDE from Gnome was Dolphin, the file manager that ships with KDE. When I made the switch a couple of years ago, the Find feature in KDE worked really well. But some time in the last couple of years, the two distributions I’ve been using – Kubuntu and Linux Mint KDE – haven’t had the Find feature working from the base install. I’ve muddled along without that feature for about two years (I don’t always need it, but there have been a few times when I really did need it and it didn’t work). I finally figured out how to get it working. It has to be one of the most ridiculously broken elements of Linux I’ve ever discovered as the solution is convoluted and counter-intuitive. Dolphin has done that for the last two or three years or so, which means I haven’t been able to use this very basic feature of the file manager. If you look around for advice on how to fix this, you’ll get mired in a bunch of forums that suggest different things about “baloo,” the new search program in KDE (that replaced Nepomuk, the failed, processor-hungry semantic search engine that no one really liked). Here’s the problem with “baloo”: it’s not installed by default in Linux Mint KDE or Kubuntu. That’s actually fine if you don’t need this search feature. But, and here’s the convoluted part of this, you don’t actually use baloo for the search function in Dolphin. However, you have to install it in order to enable the search function in Dolphin to work, but then turn baloo off. Seriously! It’s rather absurd and broken at the moment. We’ll return to that System Setting option in a minute. Next, go back to Synaptic and install the following packages: kde-baseapps, systemsettings (probably already installed), and kfind (also probably already installed). This fix for the Find feature in a basic program in KDE is completely counter-intuitive. In sum, in order to turn on the “search” feature, you have to install a package that you aren’t going to use, install another package that you are going to use, and then turn off the first package (baloo). Why? Why? Why? KDE programmers – I love your software! I really, really, do. But this makes no sense. Can you please decide on a file/folder search solution, install it by default, and then make it a simple click of a button to turn it on or off? This should not be anywhere close to this complicated! I’m using KDE/Dolphin on Linux Mint 17.1 and 17.2 and the bug (sorry, can’t sugar-coat it) still exists. With your explanation here I got KFind running finally, but still I can’t find files e.g. by date. Yeah, I don’t entirely understand why this is the current situation on KDE. I think (don’t know for sure) that the idea is that the krunner application (what comes up when you hit Alt+F2) is supposed to eventually take the place of trying to find files in Dolphin (not sure why you can’t use both). When you turn off Desktop Search in the System Settings, krunner no longer searches for files, even if you have the Desktop Search plugin checked in krunner’s settings. In other words, there seems to be some level of conflict or disagreement among the KDE programmers as to where file searching should be done: in krunner or Dolphin. Why these are mutually incompatible is beyond me. It’s stupid. Someone at KDE needs to fix this. Wow! This has been plaguing me for a long time, and has discouraged me from urging my friends into Linux as strongly as I used to. Such a fundamental, necessary function, that has to work! THANK YOU SO MUCH! I don’t know how you figured this out. The cryptic hints getting me bogged down in baloo just didn’t solve the problem. I finally decided I would stick with trying to figure it out until I did. It took me about 3 hours one night, but I found a process that worked and after I double-checked that it did work, I did a little cheer! It involved lots of googling and the willingness to totally bork my laptop that I was going to reformat soon anyway. I didn’t end up messing up that install, but I was willing to in order to figure this out. Does this work for LinuxMint 17.2? How do you disable baloo? You disable baloo by turning OFF “Enable Desktop Search” in System Settings. I’m running LinuxMint 17.2 on three of my computers (Kubuntu on one a fourth). This fix works on all four of them. I disabled the File Search Option in Desktop Configuration. After reading Ryan’s post,I disabled the baloo search option in Desktop configuration. And Lo and behold Dolphin started giving the search results again. this is handy! thanks a lot! Hats off to you ryan. I’m using debian Wheezy with xfce, but prefer Dolphin as the file manager and the search function has never worked since I installed Dolphin. Saying this as it’s not isolated to Linux Mint and the solution works, at least on my system, so probably would work for others also. Your directions above are magic. Thankyou. Excellent detective work. One wonders how you ever came up with something so counter intuitive. Brilliant! How in the world did you figure this out?! I am also using Linux Mint 17.3 Cinnamon. Thanks. It really does the trick although it’s completely senseless. Thanks. Turning off the search in system settings disables baloo but not searching in general. KDE then uses a more “conservative” approach to finding files by traversing the filesystem each time you start to search — something like “grep -r -i searchstring”. It just doesn’t use baloo, so no meta-keyword database indexing with accessing is done. This is why this is way slower for large directories and thousands of files. Apart from this I really currently don’t get baloo to work either. krunner does find something but I don’t really know how, dolphin find does not find anything. So, in a sense, for me it is still a mess. Been fiddling with Plasma 5 over Kali-rolling, liked Dolphin but, up until literally 10 minutes ago when I found Ryan’s post, was equally frustrated with the inability to search. On Plasma 5 Ryan’s fix is System Settings > Search > File Search and disable the checkbox ‘against Enable File Search’ which, on my system, lists the externally mounted file systems. My native file system is SDA3, but my mounted volumes are a mixture of FAT32, NTFS & PTP/MTP. From the file system point of view the exception thrown by Dolphin, and the fix, make perfect sense if the search protocol(s) required for my external sources are not the same as that launched from an SDA3 filesystem. And vice versa (if the search protocol launched from within a FAT32 volume falls over when it reaches an SDA3 volume). If someone has mounted filesystems the same as their native ones (I don’t) then perhaps they could see if this supposition works? Anyway I am a happy chappie now I know how to manage the issue. If Dolphin gets fixed, then I will be ecstatic. 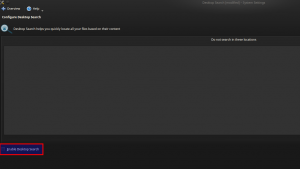 Update: did an upgrade and dist-upgrade and Dolphin died again …… could not be resurrected using this fix on my system. Still digging for a fix. This has been driving nuts! Thanks for the rather stange fix! I won’t ask you how you found this solution. Great! Kubuntu 16.04’s Dolphin doesn’t ‘Find’. There is already a ‘Search’ item in System Settings, with Plasma Search having a selection. Baloo4 wants to remove a whole slew of apps, the suggested alternative (baloo-kf5) is already installed. Is one of the Plasma Search items the culprit? I removed baloo afterwards, and the find in dolphin still works. How did you find this solution? I am running Ubuntu 16.04. I followed your steps but still no search in Dolphin. Do you think the steps should be different for my os? thanks for your effort in any case. This is 10/2016 and this issue still exists in Debian 8 / Jessie!! Your fix works for Debian 8 with KDE desktop. Kudos and thanks! I have the same problem, I open dolphin in Ubuntu 14.04 and this open and it don’t shows any files or folders. dolphin(4302): No ksycoca4 database available! I try to follow this tutorial but Not appears the icon Desktop Search on System Settings. Some idea to help me? Are you out of disk space or maybe have write permissions wrong on drive? or you could just switch to a KDE distro like tumbleweed and not have any problems. Lies. Same bug on KDE Neon. i said tumbleweed not neon, and baloo/search works perfectly – not a lie. I can’t open systemsettings, because systemsettings only runs under KDE. I have LXDE. Is there a file I can manually edit to get search working in Dolphin? Sorry, I don’t run LXDE. I can’t be of any help with that desktop environment. This solution also works on Debian 8! Thanks! This is KDE Neon 5.8 (base is Ubuntu 16.04 LTS). A KDE, freaking, Neon – KDE own distro. And this problem is still there! Enter anything in search – and it does not work. 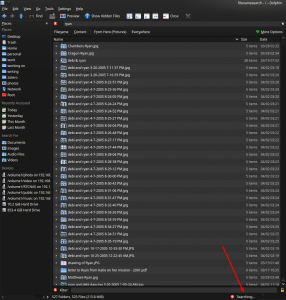 Quering balooctl status says it indexed a whopping 11 files!! I have added all my drives there. All permissions are correct. And this! You solution disabling baloo and using kfind instead worked like charm! The options to pick modification date and file type are grayed out, but why should I care if default search itself is broken? 1. 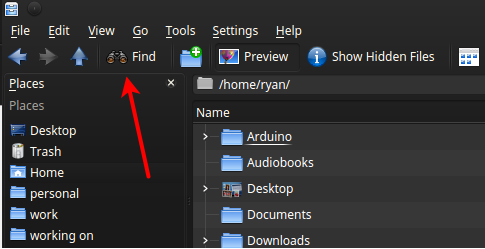 In System Settings > Search > Plasma Search, some filetypes have a hidden configuration icon. Also 2. the System Settings > Search > File Search, the description actually says “Do NOT search the locations” and it seem to automatically add ALL MOUNTED partitions there! Means, if your data resides on different partition than /home, regardless how it was mounted (fstab, automount or KDE login mount) it will not be indexed! And I assume that’s majority of people do! Once I REMOVED everything from “File Search” section, it started to find my files. However, it seem to have problems with links, as it finds the same file over and over. Regardless, removing baloo and using kfind is a good way if static search is preferred (baloo is dynamic and constantly indexes). Kfind static search finds only files and takes much slower to do so, but does not need to be constantly running. Has always worked just fine by default on PCLinuuxOS KDE and still does. This is still THE SOLUTION, thanks a lot. to me the stupidest thing about baloo is that “by default” it doesn’t index plain/text mime types, which means no content search in text files. I’m going to apply your tip, thank you very much! Ryan, your resolve to solve and document this probem are still appreciated two years later. The KDE team responsible for this error still have not taken notice of its severity. Thanks a Lot Ryan !!!! Two years on, and this bug still exists. At least with the current Mint install I didn’t have to install / disable packages – everything I needed was already in place. I just had to disable File Search in the settings to enable it. Which is stunningly counter-intuitive. So, maybe, that’s why Ubuntu does not choose KDE. Thank you!! This is still broken in Kubuntu 17.10 / KDE 5.10 . Seriously wtf. Appreciate you documenting the workaround as I never would have tried disabling the search feature to use the search feature. Just here to let everyone know that it’s 2017 I’m running KDE Neon and the search function on Dolphin is still a broken pile of trash. Baloo is awful, KDE is for morons, and George Bush did 9/11. I’m going to be 100% honest with you – after almost 10 years of KDE I never knew it worked at all. My world has just been blown wide open. Thanks. Still broken. Only now your fix doesn’t work in Mint. If I try to install Baloo4, it wants to uninstall the desktop and Dolphin! Some kind of baloo is installed by default, but it’s major league broken. Tried just turning of the search files, and it runs, but never returns a result. runs all of a fraction of a second. So it looks like I’ll need a damn shell script just to search in files for a text string. It should not be this hard to have a user friendly find in files function. Sadly this also seems to impact Kate’s feature to search in files, because it can’t find any files. What version of Mint are you running? I’m currently running Kubuntu 18.04 and find is working fine in Dolphin without any modifications right after installation. Thank you so much, Great to have find working again on my Debian stretch machine. “Enable Desktop Search.” is the Wrong Name for a feature that Excludes directories from the search.